George Bakewell was born about 1916 in what was then Five Ways Staffordshire which is noe Heath Hayes and was the son of William and Lily Bakewell. (nee Bladon). In the 1911 census his parents are recorded as living at 87 Stafford Street,Heath Hayes. The 1911 census also records two sisters Ethel May age 4 and Lily Elizabeth aged 3. He is buried at St. Charles De Percy War Cemetary Grave reference III.A.1. St Charles de Percy War Cemetery is the southernmost of the Normandy cemeteries. The majority of those buried here died in late July and early August 1944 in the major thrust made from Caumontl’Evente towards Vire, to drive a wedge between the German 7th Army and Panzer Group West. Joseph Beddow was the son of Jabez and Gertrude Beddow (nee Owen) of Brownhills, Staffordshire. Norman Beniston was the son of a bricklayer ArthurStephen Beniston and Barbera Usher Beniston (nee Bennetts). He was born in Durham in 1920. At the time of Normans death from the record of his will as living at 247 Wimblebury Road, Heath Hayes. He died on the 23rd / 24th October 1943 is recorded at the Phaleron War Cemetery Athens, Athens Memorial Face 5 aged 23 years. Herbert Boston was the son of Sydney and Emma Boston (nee Talbot) and married Dorothy Boston (nee Cox) in 1940. Ernest Chaplain was born on the 4th February 1910 the son of William Ernest Chaplain and Beatrice Chaplain. He had a sister Florence and a brother William. He married Rosanna Bott in 1932. Ernest served on HMS Odin and when war stated was in Singapore with the eighth flotilla. When Italy declared war on the 10th June 1940 Odin was patrolling off the Italian Naval Base at Taranto. Odin was depth charged and later rammed on the surface by the Italian destroyer Strale and destroyer Baleno and sank in the Gulf of Trantoin June 1940. Odin was lost with all hands. James was born about 1920 and was the son of William and Kate Dyke. He died on the 25th September 1943 aged 23 and is buried at the Massicault War Cemetery Tunisia grave reference VI. G. 16. Harry George was the son of Richard and Cissie Anne George and married to Gwendoline Maude George. He died in June 1940 serving in the France and Belgium campaigns. From the Army list Richard Henry Gumbley was born on the 13th August 1901.There is a record recorded in India Select Marriages that he married Elsie Marie Prime on the 30th January 1926 in Colada, Bombay, India though the surname is spelt Gambley which is believed to be an error. There is on the 1911 census a record for Elsie Marie Prime living at 150 Cannock Road, Heath Hayes the daughter of Joseph and Ellen Prime. On the incoming passenger list from Bombay to Liverpool for the 28th November 1933 there is a record for a Elsie Gumbley listed on the ship California arriving at Liverpool with the address given as 242A Hednesford Road, Heath Hayes with the occupation of Housewife at the age of 33. Then on the 8th March 1934 on the ship Tuscania returning to Bombay with her address listed at this time as 282A Hednesford Road, Heath Hayes, as a tourist. On the 27th April 1937, also on the ship California from Bombay to Liverpool Richard and Elsie Gumbley are listed as arriving from Bombay to reside in Heath Hayes. Richard’s occupation at this time is given as Police Officer aged 37. On the 16th October 1940he received an emergency commission to 2nd Lieutenant in to the Indian Army. On the 15th April 1942 he is listed as Captain. In the London Gazette on the 27th July 1945 Capt RH Gumbley EC 3940 reliqueshes his commission on the grounds of ill health and granted the honorary rank of Major. 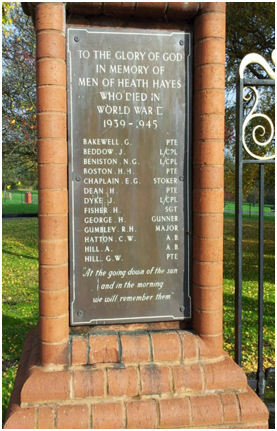 There is an additional passenger list for Richard and Elsie Gumbley arriving on the ship Scythia arriving in Liverpool from Bombay on the 16th April 1947with Richard listed as retired and living at 282 Hednesford Road Heath Hayes. On the 28th April 1947 there is a Richard and Elsie Gumbley listed on the ship Aquitania travelling to Halifax Canada from Southampton. There address on the record is given as 282A Hednesford Road Heath Hayes Staffs. Richard’s occupation is listed on the ships record as Army. Richard died on the 14th October 1948 and is buried at St John’s Churchyard Heath Hayes. The Simoom went on patrol on the 2nd November 1943 from Port Said to the Aegean on the 5th it was diverted to Dardanelles ten days later she was ordered to return to Port but never arrived. It is unsure how the Simoom came to be lost. The son of William and Mary Hill of Heath Hayes. His brother George William also fell (see below). He died on the 29th May 1943 age 18 years and is remembered on the Tower Hill Memorial Panel 57 The Tower Hill Memorial commemorates men and women of the Merchant Navy and Fishing Fleets who died in both World Wars and who have no known grave. It stands on the south side of the garden of Trinity Square, London, close to The Tower of London. As mentioned above the brother of Albert Hill who was also lost. He died on the 16th July 1944 in the Western Europe Campaign and is buried at Fortenay-le-Pesnel War Cemetery, Tessel grave reference V.C.12. The son of Benjamin H. Morgan and Lily Morgan who died on the 27th August 1944 aged 21 years and is buried at St Johns Churchyard extension Heath Hayes Section D grave 5. The son of W. Hooper and Minnie Hooperof Heath Hayes and stepson of Mr J.G. Jones of Heath Hayes. The son of Edward William and Leah Hunt and husband of Doris Maud Hunt. He died on the 14th October 1939 aged 26 years and is remembered on the Portsmouth Naval Memorial Panel 33 column 1. On the 14th October 1939 the Royal Oak was anchored in Scapa Flow in the Orkney Islands in Scotland when she was torpedoed by a German submarine U-47. The Royal Oak is a designated war grave. From the India select marriages there is a record for Sidney Ingram marrying a Maud Phyllis Dunlop in Bombay on the 18th March 1929 showing his father as Joseph Ingram. He died on the 6th December 1942 and is buried in St Johns Churchyard extension in Heath Hayes. David Jones originally enlisted in the South Staffordshire Regiment but was in the Gordon Highlanders at the time of his death on the 19th September 1945. He was the son of Clara Jones of Heath Hayes and is buried at St Peters Church,Hednesford Grave reference Sec E. Row 21 Grave 5. The son of Thomas and Jessie Moore and Husband of Edna May Moore. He died on the 11th April 1943 aged 24 years and is buried at Heverle War Cemetery, Belgium Grave Reference 8.G.2. 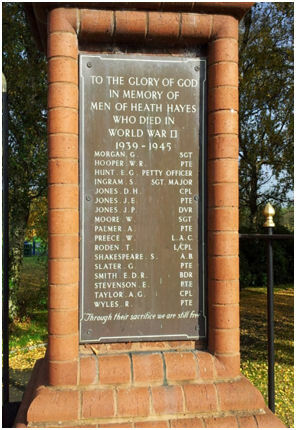 He died on the 1st May 1942.He his buried in St Johns Churchyard Heath Hayes Grave Reference Sec D. grave 1. The son of Edgar and Beatrice Anne Shakepeare and husband of Ethel May Shakespeare of Heath Hayes. He died on the 5th July 1942 and is buried in St Johns Churchyard Heath Hayes Grave Reference Sec 1. grave 1. The son of Frederick Henry Smith and Ethel Anne Smith of Heath Hayes. He died on the 11th October 1940 as result of what is recorded as an accident age 22 years. The son of Arthur and Emma Taylor of Heath Hayes. He died on the 19th June 1944 and is buried at Tilly-Sur-Seulles War Cemetery Grave reference VI. B.7. He died on the 1st January 1943 age 30 and is buried in Bone War Cemetery, Annaba.